Exciting BFC News – Announcing the 2013 Broward Folk Festivus AND Songwriting Competition! Your Broward Folk Club Board has been hard at work, and we are thrilled to announce that plans are now in the works for our 2013 annual event… the Broward Folk Festivus (Festivus II). If you attended last year’s event, you know how fabulous it was. If you missed it, you missed THE event of the year. We plan to do it again this year, but we are excited to now be able to expand to a TWO day event (the first time we’ve done that since the South Florida Folk Festival of 2008!). And… we are bringing back the Songwriting Competition, which was always one of the most exciting parts of our past Festivals. Festivus will be held on Martin Luther King weekend (January 19-20, 2013). While we are not ready to post details yet (information will be posted as it becomes available), we want everybody to be aware that starting June 1st, we will be accepting submissions for our BANG/BASS Songwriting Competition. Entry can be made either via Sonic Bids or via a mail-in application that can be found on the BFC website (details below). We urge the songwriters among you to consider entering the contest. And more importantly, we urge all of you to save the dates… and to help us out by sharing the info below with all of your musician friends, near and far. We hope to receive songwriting submissions from across the country… the more we receive, the more exciting the competition will be. The 2013 annual folk and acoustic music festival – Festivus II – will be a two day event on Saturday, January 19th, and Sunday, January 20th, with the second day being dedicated to our “BANG & BASS” songwriters contests. The BANG (Broward Acoustic Next Generation) competition is for songwriters who are under 30 years of age, while the BASS (Broward Acoustic Singer-Songwriters) contest is for those who are 30 years of age and older. Submit to either the BANG or the BASS based upon your age. Submissions will be accepted starting June 1st, 2012, and will be closed on August 31st, 2012. A selection committee will then choose six finalists and four alternates for each of the two contests. Finalists and alternates will be announced by December 1st, 2012. Finalists will then perform live on Sunday, January 20th, 2013, at the BFC Festivus II at The Shack In The Back (Fort Lauderdale, FL) before a panel of judges. All contest performers from outside the Broward area must cover their own travel and lodging expenses, though home hospitality will be provided if possible. Broward Folk Club will provide space at no charge for you to sell your own CD’s at the festival. Finalists will perform 2 songs during the live competition, one of which must be the piece for which they were nominated. Judges will select a winner who receives $200 and a runner-up who receives $100 in each category. All winners and runner-ups will perform as part of an in-the-round festival finale. WHAT CAN BE SUBMITTED: Original songs in the acoustic, indie, folk, Americana, pop, singer/songwriter and associated genres. They may be on any topic and with any instrumentation. Songs may be unproduced (bedroom recordings) or production quality (studio grade). All entries must be written and wholly owned (copyrighted) by the applicant(s). Please do not submit any songs written in part or whole by anyone else, or a song whose copyrights have been sold or licensed in part or whole to anyone else. Applicants must perform and record their own submissions, and recordings can be of any length and may include multiple instruments and other performers in addition to the applicants. However, finalists will be allotted four (4) minutes per song at the live competition during Festivus II, 2013, and they must compete acoustically as either single or duo performers. FEES: BANG competition (under 30) – $10 for the first submission and $5 for every other submission. BASS competition (30 and over) – $15 for the first submission and $10 for every other submission. On-line applicants – pay on-line through Sonicbids (see above). 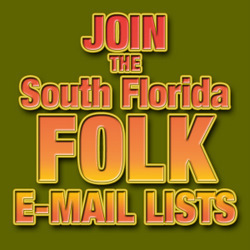 Mail-in applicants – send a single check or money order that covers the total number of submitted songs and made payable to: The Broward Folk Club, Inc.
to make your payment via Paypal. Please note that your application is not complete until your payment is received.